Packages are usually shipped within 48 hours after receipt of your payment. Regardless of the shipping method (So Colissimo or Letter Followed), we will inform you by e-mail with a link that will allow you to keep track of every step of the delivery of your parcel on the postal network. Shipping charges include packaging, handling and postal fees. For deliveries in metropolitan France, we take care of all of these charges for any order. The parcels are oversized and protected items. In order to meet the needs of each of our clients, and their utmost to facilitate the delivery of their articles, Bruce Field uses the services So Colissimo. So Colissimo is a service of The Post office, which allows you to deliver where you want, offering you 5 solutions delivery. - your home : your parcel is returned to you with clean hands. If you are absent, it will be deposited in your mailbox. If its size does not allow delivery to the mailbox, it will be made available in your post office. In all cases you are informed by e-mail 24 hours before the delivery of your parcel. - appointment : as soon as your parcel is available to be delivered, you are notified by e-mail and SMS. You will be able to select, from Monday to Friday, the time slot that suits you best for your delivery. Service available exclusively on Paris intra-muros. - in your area Cityssimo : the instructions Cityssimo are sites withdrawal automatic package available 7j/7 and 24h/24. You are informed of the availability of your parcel by email and SMS. The latter will tell you your codes withdrawal allows you to withdraw your parcel in 10 business days. - from your merchant : you can choose from one of the many merchants near your home, your place of work or holiday, with whom you want to deliver. You will be informed of the availability of your package by email that will allow you to come and remove it within 10 working days. - at your post office : you can choose the post office where you want to deliver. You will be informed of the availability of your parcel by text message and by e-mail, with a right of withdrawal, allowing you to come and remove it in the office in 10 business days. For articles of small size and low value, we use the services Letter Followed. It is an envelope that includes tracking and insurance, delivered without a signature directly in your mailbox. If its size does not allow delivery to the mailbox, it will be made available in your post office. 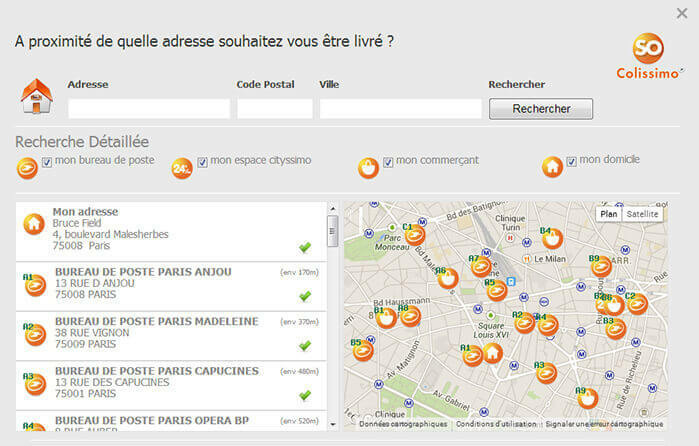 Delivery is free for orders delivered in metropolitan France. Your order is prepared by our care for you be shipped out to you within the shortest possible time. The packages are then shipped via Colissimo (or via Letter) Followed for articles of small size). For any return, please inform us by e-mail with your name and order number to the address contact@brucefield.com. For exchanges, please specify the desired article to be set aside. Upon receipt of your package, you have a period of 15 days to return, at your expense, the products not agreeing to you. Please enclose your delivery note or invoice as well as your instructions for refund, exchange or have. We will only accept the products in perfect condition for resale, which have been neither worn, nor washed, nor ironed, or altered, or soiled and in their original packaging. Any product damaged will be neither refunded nor exchanged. Exchanges are processed and dispatched within the following 72 hours. Refunds are generally made within 15 days of the receipt of the return.